REPUBLIC ACT No. 137 -Board of Textbooks. It provided for all public schools to use only those books approved by the board for a period of six years from the date of their adoption. REPUBLIC ACT No. 1425 -The inclusion of a course on the life, works and writings- especially the Noli Me Tangere and El Filibusterismo of Dr. Jose Rizal in the curricula of all public and private schools. REPUBLIC ACT No. 4670 -The Magna Carta for Public School Teachers. REPUBLIC ACT 1079 - Commonwealth Act No.117. Civil Service Eligibility shall be permanent and shall be valid throughout a person’s lifetime. REPUBLIC ACT No. 7722 -Creating the Commission on Higher Education (CHED) composed of a chairperson and four (4) commissioners. REPUBLIC ACT No. 7743 - The establishment of public libraries and reading centers in every barangay and municipality of the country. EXECUTIVE ORDER No. 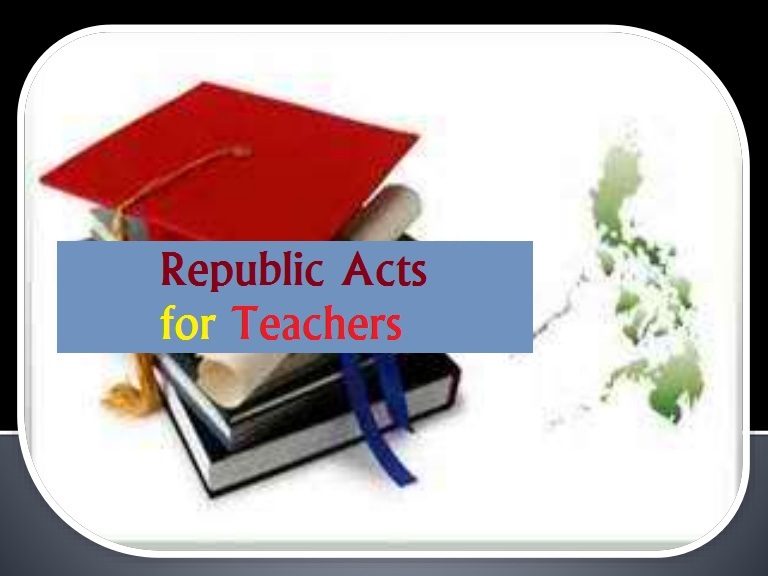 189 - All public Secondary School teachers under the administrative supervision and control of DECS. Issued by former President Corazon Aquino. PRESIDENTIAL DECREE No. 6-A - Known as the Educational Development Decree of 1972, and was implemented by the late former President Ferdinand Marcos. PRESIDENTIAL DECREE No. 146 - This decree requiring ALL senior high school students to pass the National College Entrance Examination (NCEE) as pre-requisite for admission to any post- secondary academic or professional degree program. PRESIDENTIAL DECREE No.451 - This law repealed R.A No. 6139 and authorized the Sec. of Education and Culture to regulate the imposition of tuition fee and other school fees in all private educational institutions. PRESIDENTIAL DECREE No. 688 - This law gave the Civil Service Commission the power and authority to give the appropriate examination for all public school teachers. PRESIDENTIAL DECREE No. 1139 - This decree issued on May 13, 1977, created the position of the undersecretary for NON-FORMAL Education who shall make an overall assessment of the existing non formal education programs and shall take charge of all non-formal education programs of DECS. DEPARTMENT ORDER No. 1, s.1973 - This DECS order reiterates the policy on the use of locally published textbooks of Filipino authorship in all levels of education, both public and private. DEPARTMENT ORDER No. 25, s.1974 - The implementation of BILINGUAL EDUCATION Program which mandates the use of English and Filipino as separate media of instruction. MEC ORDER No. 22, s.1978 - ALL institutions shall offer in all their curricular programs at least six (6) units of Filipino, starting the FIRST SEM Of school year 1979- 1980. DECS ORDER No. 38, s. 1994 - Provided for a National Secondary Assessment Test (NSAT) to be administered to ALL graduating public and private high school. 1987 CONSTITUTIONS ARTICLE XIV, sec. 5:4 - The Law requires Education to provide professional advancement teachers. 5. ARTICLE 356 – Threatening to publish and offering the prevent publication of an article for a certain fee. 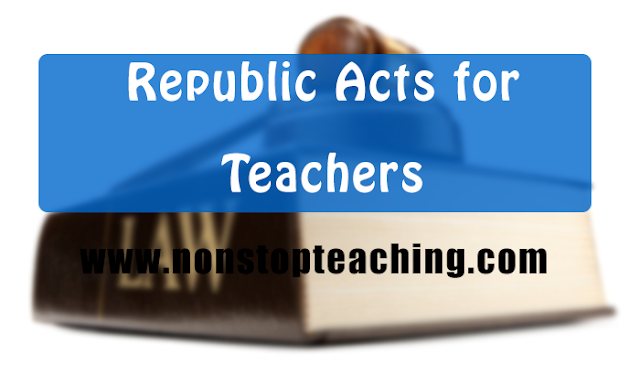 The following are the Republic Acts, Executive Orders, Presidential Decree for all teachers in the Philippines.